Chromebooks have come a long way in the last few years, with plenty of thanks to Google’s Pixel line of devices. The Pixelbook, for all its flaws, was a well designed and capable machine. This year’s Pixel Slate continues to evolve that vision of capability and design. It’s also much more than a rebirth of the Pixel C tablet. Chrome OS has grown, becoming a competent tablet option thanks to a refreshed touch interface and support for Android apps. 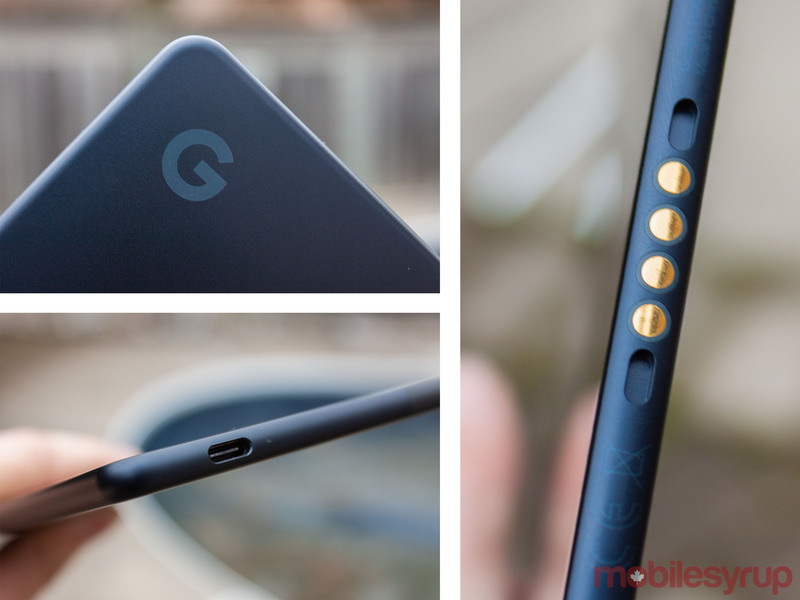 Google’s hardware design has matured as well, and it shows. The Slate is arguably one of the nicest looking tablets I’ve ever seen, even if it seems like a big Pixel 2 phone. 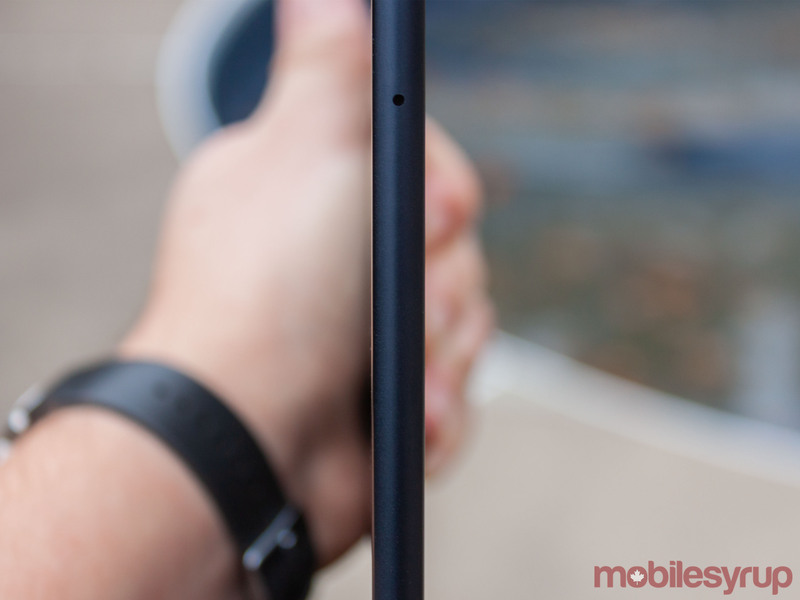 Holding it is a joy — it’s 7mm thin but doesn’t feel flimsy. It’s light, too, at 1.6lbs (.731g). The Midnight Blue anodized aluminum body feels excellent as well — although I found it held onto fingerprints. I’m also a fan of the ‘G’ logo in the corner of the device. For all the good though, some of the small things detract from the experience. Google’s inexperience in hardware comes through at some critical points. Worse, for all the Slate is, Chrome OS is still Chrome OS. Professionals, or anyone needing more than a web browser, will find the Slate lacking in some key areas. All this is to say the Pixel Slate is the best Chromebook you can buy right now. That doesn’t mean you should. Competition in the 2-in-1 market is hotter than ever, which only serves to make the Slate’s shortcomings more apparent. The Pixel Slate has a lot going for it. Aside from its gorgeous body, the Slate sports an excellent display. The ‘Molecular Display’ is excellent, easily rivaling the Surface Pro 6 and the Apple iPad Pro. Having just finished a review of the Surface Pro 6, I found myself comparing the devices constantly. The display is one of the areas I kept comparing. I preferred the Slate’s Molecular Display to the PixelSense display in the Pro 6. Mostly, that came down to the higher resolution of the former. I also found the Slate’s screen could get dimmer than the Pro 6, but it couldn’t get quite as bright. Ultimately, the devices were close enough in that regard. Colours were excellent on both, but again I liked the Slate just a bit more. Ports is another area where I think the Slate steps ahead of both the Pro 6 and the iPad Pro. The Slate has two USB-C ports — one more than the iPad and two more than the Surface. This came in handy, allowing me to connect an external display while charging, as well as utilize several different adapters and dongles to connect things like SD cards and USB sticks. While I never thought I’d praise the option to use dongles, I much prefer the flexibility of USB-C to the limitations of Pro 6’s IO options. Google does a great job nailing some of the small things when it comes to hardware as well. 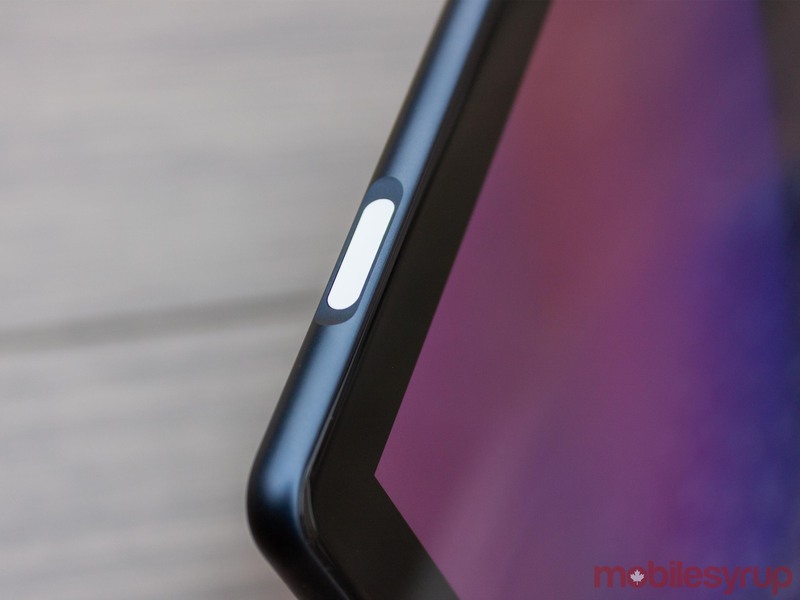 Both USB-C ports have small LEDs to indicate charging status. Additionally, the Slate came with a USB-C to 3.5mm headphone adapter for using wired headphones. Dual front-facing speakers were loud and capable for consuming media. I also appreciated the lack of a camera bump. Finally, the Pixel Imprint sensor was quite good. It was fast and accurate, and overall felt like an adequate solution. However, it pales in comparison to the facial recognition options on the Surface Pro 6 and the iPad Pro. There’s just something about turning on the screen and unlocking the device with a smile. Having to reach up and tap the fingerprint sensor felt dated in comparison. While Google may have nailed the small things with the Slate itself, the search giant slipped when it came to the accessories. First up, the Pixel Slate Keyboard: a resounding “meh.” The rounded key typing experience is fine. I didn’t find it any worse than rectangular keys, other than the spacing caused me to miss the odd key press when typing quickly. The keys themselves feel okay, although I found them mushy compared to the Type Cover on the Surface Pro 6. The Type Cover felt much snappier, but the Slate keyboard was quieter, to the benefit of those sitting near me. If you’re concerned about the rounded keys making it harder to type, they don’t interfere after a short adjustment period. If you’re anxious, I’d advise looking at the Brydge G-Type Keyboard, which attaches with a magnetic hinge reminiscent of traditional clamshell laptops. It sports regular keys and still has some of the unique buttons like the Assistant key. It’s also cheaper than the Slate Keyboard, but at the time of writing, it wasn’t available from Google’s store. 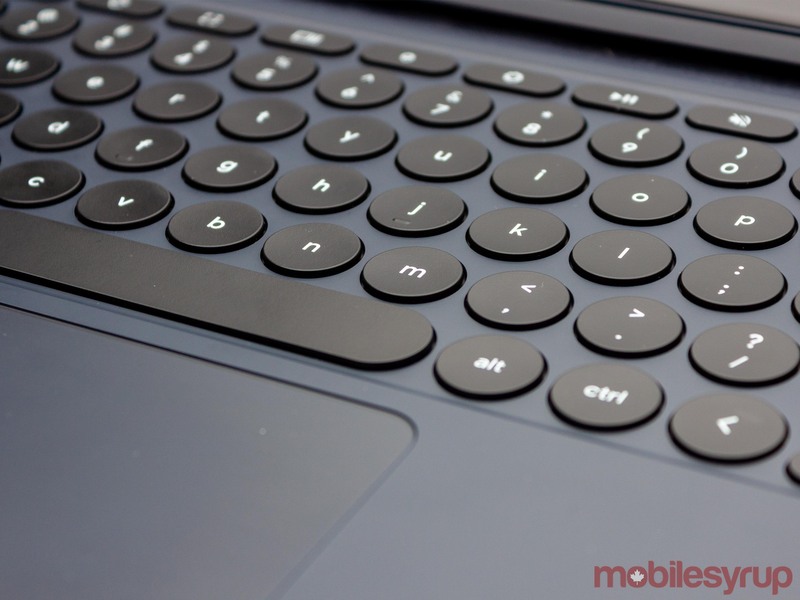 The Slate Keyboard’s trackpad is excellent as well. It’s quite a bit bigger than the Pro 6 trackpad — thank goodness — and I found my finger slid over the material easier. Also, the trackpad has a satisfying click to it. The hinge mechanism is honestly really good. It attaches to the tablet’s rear using magnets, allowing for easy adjustability by sliding the cover along the back of the device. About two-thirds of the way up the back, a set of stronger magnets lock the hinge in place. While you can fiddle with the mechanism to get the screen to lean back further, it’s difficult and not worth the effort. One other drawback to the magnets is that it can be difficult to judge how much force is needed to separate the back of the tablet from the cover. On several occasions, I found myself overdoing it, causing the screen to slam closed when it suddenly popped free from the magnets. The Slate Keyboard works reasonably well, but again, I preferred Microsoft’s solution. Also, I love that I can use the kickstand without the keyboard on the Pro 6, making it a great option if I want to draw at an angle or have the tablet stand on its own while watching a video. You can fold the Slate’s keyboard out of the way, but it’s still attached, and you can’t get rid of it if you want the tablet to stand. Further, because the keyboard is directly connected to the hinge, I found it made the screen bounce when I typed on my lap. While the Pro 6 remained stable for lap use, the Slate rocked about, causing for a rather unpleasant experience. Worse, the keyboard makes the Slate much thicker and heavier when attached. Alone, the Slate tablet is thinner than the Pro 6, but with the Keyboard connected, the Slate is thicker and heavier. Another significant annoyance with the Slate Keyboard is that when closed, it hardly stays that way. The Type Cover locks in place with magnets when closed, but the Slate doesn’t seem to do that. The result is that the keyboard slides about loosely on the screen. While the four rubber feet on the keyboard will likely prevent scratches, its just not a great experience when you pick up the closed Slate and have the cover slide around in your hand. The most egregious part of this is the price of the accessory. At $259, it’s frustrating that the Slate Keyboard can’t achieve some of the essentials like the $170 Type Cover. I’d also like to take a moment to address the digital inking experience, as both devices have pens — the Pixelbook Pen and the Surface Pen. Both cost $129, but the Pixelbook Pen is far inferior to the Surface Pen. From a hardware perspective, the Pixelbook Pen’s lack of magnets to attach it to the tablet is infuriating. 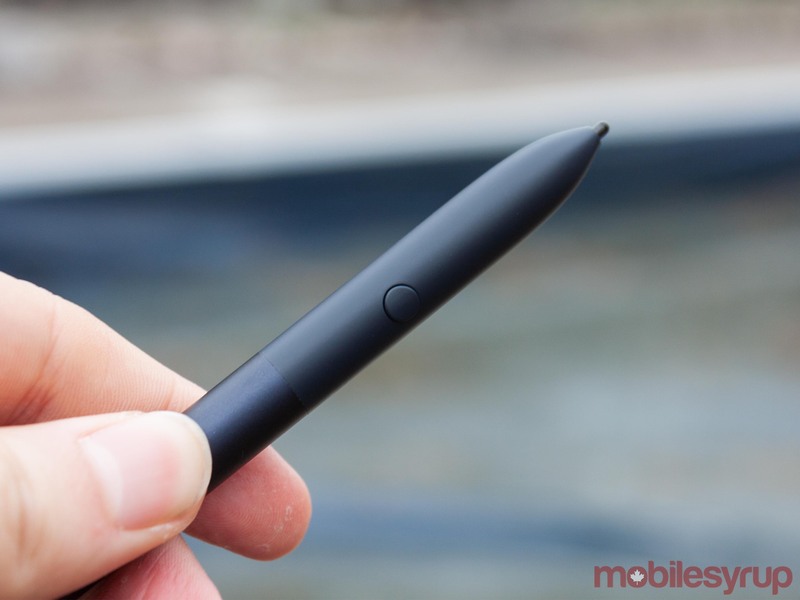 This is a simple thing that makes it incredibly easy to bring the pen with you on the go. Even Apple does this now with the refreshed Apple Pencil. Further, the Surface Pen has a button on the top that doubles as an ‘eraser.’ It makes for an intuitive experience when I can spin the pen around and erase what I wrote. As far as software goes, the writing experience was a little weird with the Pixelbook Pen. The writing felt delayed at times, and often I could see the digital line following a different trajectory on the screen then the tip of the pen, mainly when drawing a curve. It always corrected itself, but it was a bit disconcerting when writing. The other big issue with the pen — and the Slate in general — was software. When using the pen to draw, or trying to do anything that needs more than just a web browser, the fissures in the Slate become apparent. The apps people need aren’t there. This has been a long-running complaint with Chrome OS, but it continues to be a poignant one, more than ever now because Google markets the Slate as a laptop replacement. The Slate does not have the app selection or software availability to replace a Windows or macOS system, plain as that. Chrome OS has gotten a lot better — the addition of Android apps and Linux apps to the ecosystem helps close the gap. But it’s unfortunately not enough yet. As far as Android apps go, I found the experience lacklustre. The Slate takes apps designed for phone screens and stretches them across the display. Plus, interfaces designed for thumbs aren’t great with keyboards and mice. I do about 90 percent of my work in a web browser. I’ve moved as much of my workflow online as possible to make things easy when switching between review devices. However, it’s that last 10 percent that makes Chrome OS infeasible for me. In my case, that’s Photoshop. I know there are alternatives out there, like Gimp, that will work on the Slate thanks to Linux app support. But in my case, I don’t have time to relearn my entire workflow in a different program on a different OS. Additionally, most consumers won’t have the time to learn how to use Linux. I recognize that not everyone will have that same problem. Plenty of people out there don’t use or need Photoshop. But, I’d also argue that the vast majority of people rely on some app or program that isn’t available on Chrome OS. For those of you who don’t, Chrome OS is an excellent choice. It’s incredibly snappy, it’s not taxing on the hardware, and it’s easy to use. But if you’re the type of person who only needs a web browser, you likely don’t need a powerful processor either, in which case I still can’t recommend the Slate. The review unit provided to me was the second highest model, with the Intel i5, 8GB of RAM and 128GB of storage. It retails for $1299. That’s a hefty price tag for the power you don’t need. The lowest model is $849 with an Intel Celeron processor, 4GB of RAM and 32GB of storage. That’s a big ask for a Celeron processor, especially when similarly specced Chromebooks are available for as low as $249.99. In a vacuum, the Slate is terrific. It is, without question, the best tablet device from Google yet. However, I think the company’s biggest misstep with this device is the price. The i5 variant of the Slate costs $1299, about $120 more than Microsoft’s Surface Pro 6 base model at $1180. Both models have 8GB of RAM and 128GB of storage. Both have 12.3-inch displays, although the Slate’s is higher resolution. Both have i5 processors, but not all CPUs are equal. The Slate sports an i5-8200Y processor, whereas the Pro 6 has an i5-8250U. The dual-core 8200Y is significantly slower than the quad-core 8250U, especially in the multicore segment of benchmarks. While benchmarks certainly aren’t the be all and end all of the CPU comparisons, it’s plain that Google chose longevity over performance. The Y series chips use less power, making them friendlier to batteries. On the performance front, Chrome OS doesn’t typically tax the hardware too much, so the 8200Y performed excellently. However, I find it hard to accept that I could pay less money and get a faster processor along with full Windows in a package the same size as the Slate. With that in mind, I chose to put the batteries to the test to see if the low-power 8200Y was worth the extra cash. 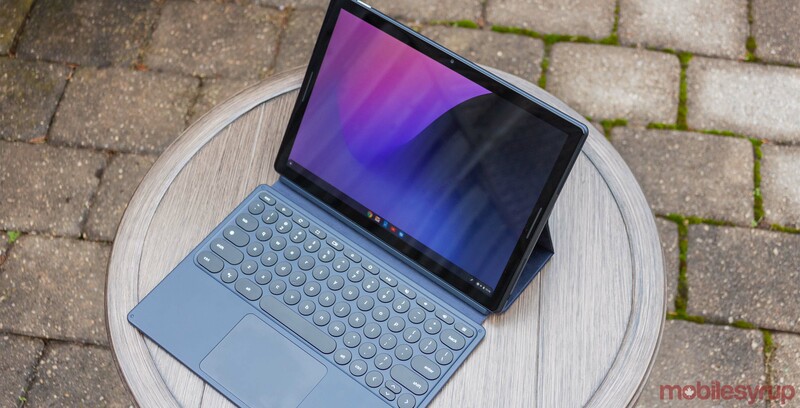 I emulated my typical workload on both the Surface Pro 6 and the Slate — I had Slack, Trello, Grammarly and TweetDeck open along with a ten-hour YouTube video as I typically watch videos or stream music while working. I opened these in Edge on the Surface Pro 6 since Microsoft claims it provides the best battery life on Windows. Finally, I had both devices at the maximum brightness. The Surface Pro 6 lasted five hours and 45 minutes and the Slate ran for an extra hour and a half after that. Ultimately, an extra hour and a half battery life doesn’t justify the higher cost of the Slate. It’s hard to justify the Slate at $1299 when then more powerful -- both in hardware and software -- Surface Pro 6 is available for $120 less. Further, I haven’t factored in the cost of the requisite keyboards, which are $260 for the Slate and $170 for the Surface. All told, that’s a difference of $210. On the lower end, Chromebooks with similar hardware are much cheaper. And if you want a tablet experience, the iPad has yet to be beaten. Overall, the Pixel Slate is an excellent device. It does so much well and comes incredibly close to competing with both the iPad Pro and Surface Pro 6. In such a crowded area of the market, however, shortcomings standout. Against the iPad, the Slate has a weak selection of apps. Against the Surface Pro 6, the Slate missteps on crucial missing software as well. Chromebooks undeniably have a place and position in the market and can make for great low-cost devices for accessing the internet. But Chromebooks -- the Slate included -- can’t replace a typical portable computing experience from Apple or Microsoft, especially for a professional workload. If you want the best Chromebook money can buy, get the Slate. Outside of that, you’d be better served by either the iPad or the Surface Pro 6. 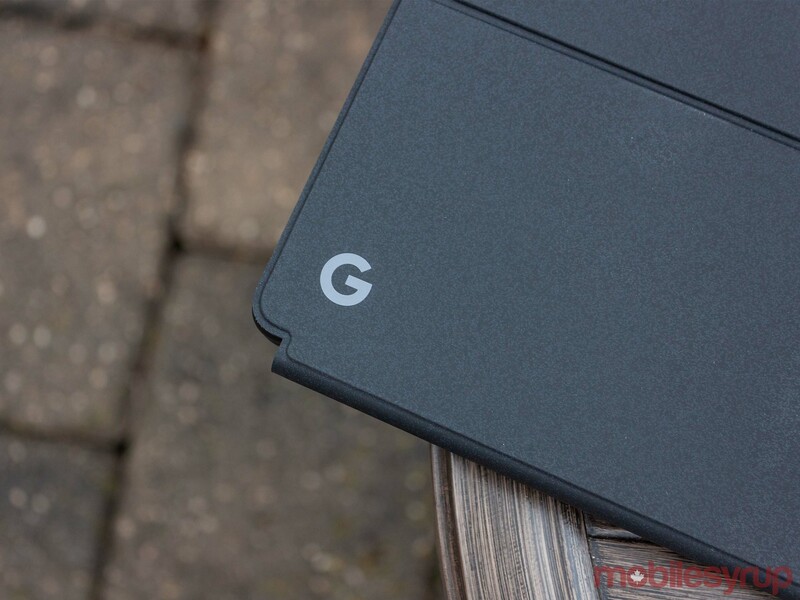 "If you really need a Chromebook, options from other manufacturers provide similar experiences without the large price tag"